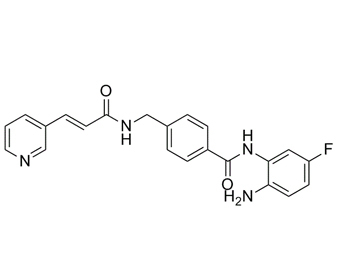 Chidamide, also known as Tucidinostat , CS055 and HBI-8000 , is a n orally bioavailable benzamide type inhibitor of histone deacetylase (HDAC) isoenzymes 1, 2, 3 and 10, with potential antineoplastic activity. Chidamide selectively binds to and inhibits HDAC leading to an increase of acetylation levels of histone protein H3. This agent also inhibits the expression of signaling kinases in the PI3K/Akt and MAPK/Ras signaling pathways and may result in cell cycle arrest and the induction of tumor cell apoptosis. This may inhibit tumor cell proliferation in susceptible tumor cells.
. Ning ZQ, et al. Chidamide (CS055/HBI-8000): a new histone deacetylase inhibitor of the benzamide class with antitumor activity and the ability to enhance immune cell-mediated tumor cell cytotoxicity. Cancer Chemother Pharmacol. 2012 Apr;69(4):901-9.
. Gong K, et al. CS055 (Chidamide/HBI-8000), a novel histone deacetylase inhibitor, induces G1 arrest, ROS-dependent apoptosis and differentiation in human leukaemia cells. Biochem J. 2012 May 1;443(3):735-46.